This year’s Trinity Institute has concluded. The keynote speaker was Rowan Williams, who spoke with a stellar line-up including Sir Partha Dasgupta and Professor Kathryn Tanner. All the plenary talks, discussion panels, and the opening Eucharist are available as video on demand. Anyway, Archbishop Rowan has written a short piece for Newsweek summarizing some views shared at the Institute. Here’s a snippet. But we must hang on to the idea that not everything reduces to one standard of value. Treat economic exchanges as the only “real” thing that people do, and you face the same problems confronted by the evolutionary biologist (for whom the only question is how organisms compete and survive) or the Freudian fundamentalist (for whom the only issue is how we resolve the tensions of infantile sexuality). Traditional religious ethics—traditional ethics of any kind, in fact—do not require you to ignore the hidden forces that may be at work in any particular setting. Being human is learning how to ask critical questions of your own habits and compulsions, and it’s learning how to adjust them against a model of human behavior—an idealized truth about the purpose of our humanity. As I said before, I was one of two official bloggers for the event, along with Professor Catherine Mann. I watched the conference from home and posted reactions to each speaker, engaging in conversation with Mann as well. Go have a look at the blog. I will take several days to process fully what I heard during the conference. Let’s just say we religious folk have a lot of learning and work to do as we engage the public sphere to build an ethical economy. Next year’s program looks pretty interesting too. You can learn more or sign up here. 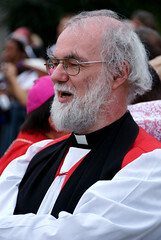 Photo ACNS/Scott Gunn from the Lambeth Conference 2008. More here. Thanks, hey…what’s up with the Acura Ad on your post? Peter, now I see it. I use ad blocking software on my browser, so it never showed up. Finally checked it in another browser. Oops. When I copied the text from Newsweek, I must have grabbed the code for the Acura ad. Funny. Anyway, I got rid of it. Kind of funny in a post about “God and Wall Street” to have an accidental Acura promo. Thanks for letting me know. That could have been there for days. Zoinks. I think I missed the “wall street” connection. Certainly there are those that treat economic exchanges as the only real thing people do, but this does not necessarily denote the presence of wall street, or, I suppose in its broader meaning, a free market economy. Capitalism was developed within a framework – culturally and ethically – that most certainly did recognize other realities (in particular, God). It is Marxism that is inherently materialistic and atheistic – that treats economics as quite literally all that matters.